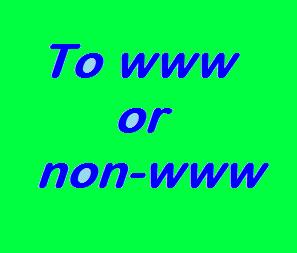 To www or non-www (not-www). Do you need to do a 301 redirect? If you did the same, you would see that the www version is automatically redirected to my preferred one, the non-www version. If you typed both into the browser and both were resulted as you typed, then Houston, we definitely have a problem and in Google’s eyes, I’d have some major duplicate content…..or page rank would just be split between both sites. Why do I prefer the non-www version? It’s what I started with by accident. And now I just think it looks better. I think it’s easier to write. It’s shorter and, therefore, gives you more link real estate in search results. Some people think www let’s people know you have a website. I say duhhhhh. The .com on the end pretty much takes care of that. One of my concerns was if there were back links in, say, the www version–but your actual conical/live site is the non-www version–could this hurt your SEO. As far as I can tell from the literature out there, the answer is no. As always, in the setting of post Panda, anyway, content is king. Write good content and write for people instead of a keyword tool; and if your content is relevant in the lives of the masses, Google will find you and you will have all the traffic you can handle. If you have traffic and need a way to monetize that traffic, I have a very effective tool. Take a look and get in touch with me and let’s talk.